"What are the Parts of the Mass?" "What Do I Miss When I Come in Late?" ". . .When I Leave Early?" "What are the Parts of the Mass?" Here is a basic overview of the four parts of the Mass: the Introductory Rites, the Liturgy of the Word, the Liturgy of the Eucharist, and the Concluding Rites. 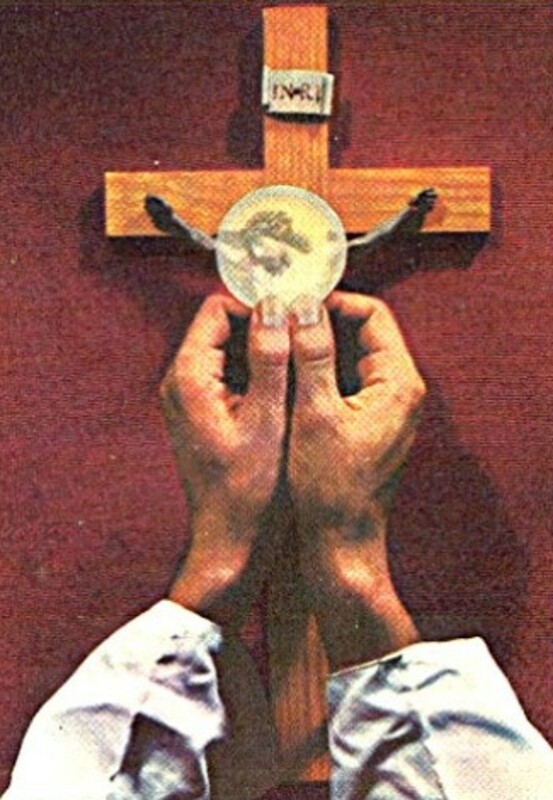 The two principal parts of the Mass are the Liturgy of the Word and the Liturgy of the Eucharist. These two form one unified act of worship. We are first nourished at the able of God's Word through the readings from Scripture, and then at the table of Our Lord's Body, which we receive in Holy Communion. WHAT DO I MISS WHEN I COME IN LATE? WHEN I LEAVE EARLY? These two central parts of the Mass are flanked by two smaller parts: the Introductory Rites and the Concluding Rites. The Introductory Rites open the celebration of the Mass and prepare the faithful for their sacred encounter with God in His Word and in the Eucharist. So if we come in late, we are not “preparing” properly for Mass. After Communion, the Concluding Rites formally close the celebration and send the people forth to do good works and take Christ into the world. Mass is not over at Communion. We must remember to kneel down after receiving the Body and Blood of Jesus Christ and give thanks and praise to Him. Then after the Blessing, we sing joyfully together as the priest processes out. 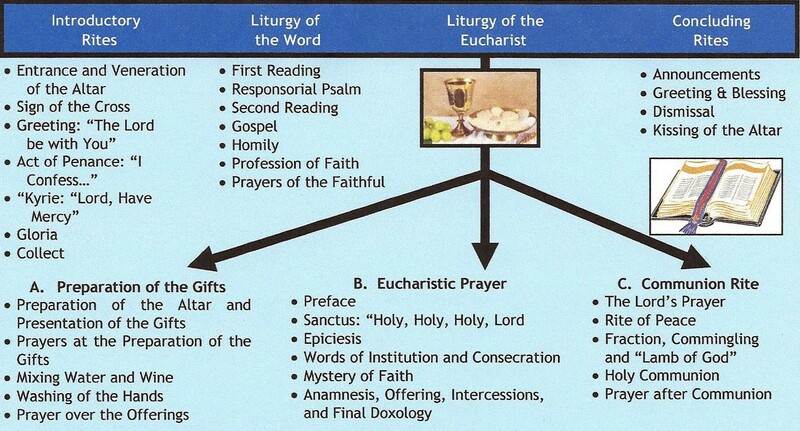 The chart below lays out these four main sections of the Mass, which serve as an umbrella for the smaller, individual parts of the liturgy. Keeping this "big picture" of the Mass in mind will be helpful to become more faithful participants.